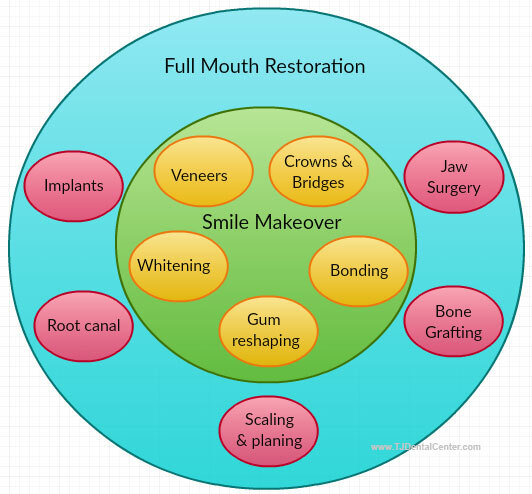 Complete oral rehabilitation, also known as full mouth reconstruction/restoration consists of all the procedures performed to rebuild and/or restore all of the patient’s teeth in both the jaws. Such procedures include and may not be limited to crowns, bridges, implants, dentures and veneers. We at TJ Dental Center offer full mouth restoration in Tijuana, Mexico for a fraction of the US prices. Tijuana is a border city in Mexico right across the port of entry at San Ysdiro, California. The port of entry is open 24*7. The nearest American airport (the San Diego International Airport - IATA Code: SAN) is only about 20 minutes from TJ (click here for more information on getting there and the travel documents required). TJ abounds with tourist attractions which can be explored while on a full mouth rehabilitation trip. Click here for more information on travel attractions of the Mexican border city. Extraction of any damaged tooth that could interfere with the rehabilitation process. Extraction may be accompanied with alveoplasty (for smoothening the jawbone). Bone grafting may be performed in case of low bone density in the jaw area and for fortifying the region. Sinus lift may be performed to strengthen the region where the implant is to be placed. Laser therapy may be performed to expedite recovery and keep infections at bay. In the first surgery, the surgeon will insert the dental implant (artificial tooth root) and close the site. 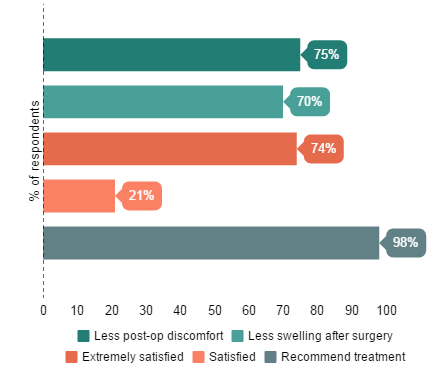 The second surgery will take place 3 to 6 months after the initial surgery in which the surgeon will place an abutment over the implant after it has successfully fused with the jawbone in a process known as osseointegration. This abutment will be topped with a crown. Note - One stage dental implant surgeries are also available which involve placing the implant, abutment and a temporary crown in a single visit. 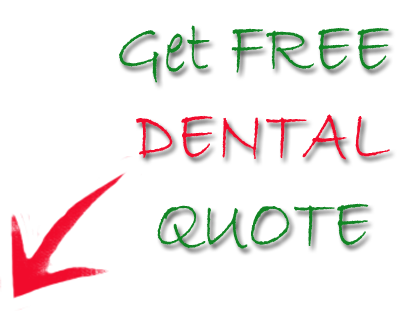 Click here for more information on affordable dental implants in Tijuana, Mexico. Practice good oral hygiene by brushing your teeth everyday using a special interdental toothbrush that can reach all the nooks and crannies around your new teeth. Make sure to have your dental check-up every six months. Avoid chewing on damaging objects, such as ice and candy which could harm your crown; refrain from stain-causing foods and beverages, such as tea, coffee, and red wine. 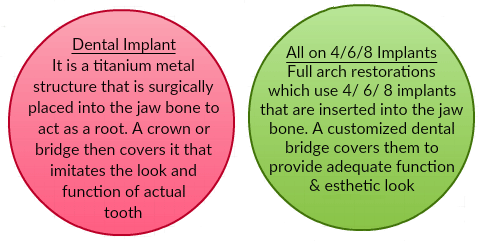 Unlike all on 4 implants, all on 6 and 8 implants require adequate bone in the jawbone. These involve placement 6/8 implants in the jawbone and are topped with dental bridges made of 12 to 14 units of teeth. While other solutions may require a minimum of six implants and bone volume, the all on 4 implant system allows you to get a full set of teeth in a jaw based on only four implants in just one day. Hence, it is also known as teeth in a day. The mouth will be evaluated by performing some diagnostic tests, such as CT scans and dental x-rays. The treatment will begin by numbing the area using an anesthetic. The implants towards the back will be dug in at a 45 degree angle so as not to interfere with the sinus cavity and the nerve canal. After the implants are secured into the jawbone, these will be attached with abutments which will then be fastened to either a bridge or a denture. Click here for more information on hybrid implants such as All-on-4 dental implants in Tijuana. Any damaged teeth that may interfere with rehabilitation process will be extracted. The dentist will take gum impressions. These impressions will be used to make the dentures. The dentures will be tested to ensure that the bite is appropriate. Make sure you scrub your dentures daily. 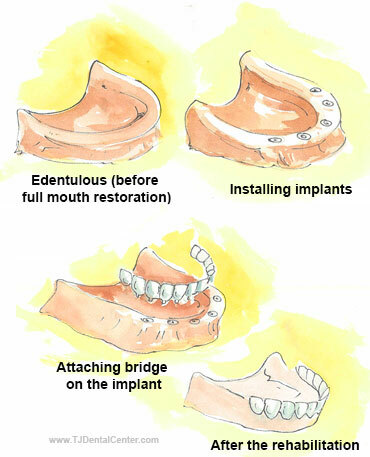 Another version of removable dentures is over-dentures or implant secured dentures. Instead of resting on the gum line, these dentures are supported by implants embedded in the jawbone. The first surgery involves placement of implants in the jawbone. For this an incision is made in the jawbone, followed by drilling holes in it. The implants are placed in the holes, and the incision is sutured back. After their successful osseintegration with the jawbone (which may take three to six months), the oral surgeon performs a second surgery to expose the tops of the implants (in the time period during which the implant fuses with the jawbone, the surgeon may place temporary dentures resting on the gumline). This is followed by placing caps on the top of the implants . 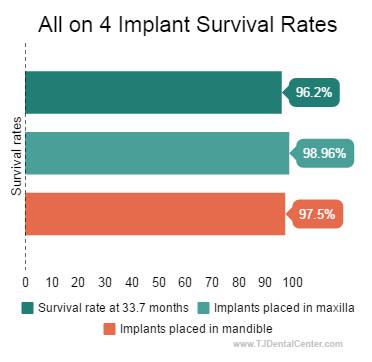 A few days after the second surgery, the implant tops will be replaced with abutments. The surgeon will take impressions of your gum to make the denture framework. This will be followed by placement of a metal bar on which the dentures will rest. The denture will be placed on the metal bar and if everything goes well will be secured with ball/bar attachments. 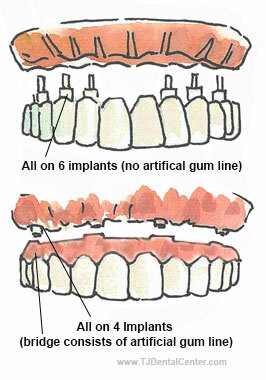 Since these dentures will be clipped/snapped on to the attachments, these are also called snap-on removable dentures. Overdentures can be taken care by interproximal brushing in addition to regular brushing and flossing. These are alternatively known as fixed partial dentures (FPD). The abutment teeth (the two teeth on either side of the gap which will hold the bridge) are reshaped by removing part of the enamel and dentin so that they can be topped by a crown. Impressions of the teeth are made; till the time the bridge is ready, a temporary bridge is placed over the prepared teeth. Once the bridge is ready the temporary bridge is removed. The new bridge is fit into place and checked for its placement. 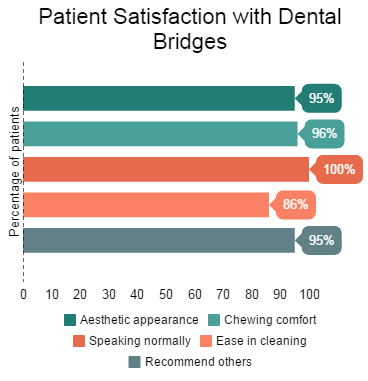 In case of a fixed bridge the dentist will fix it with special cement. Maintain oral hygiene with brushing, flossing and rinsing the mouth. This stage will involve examination of your teeth, followed by taking x-rays and making impressions of your mouth and teeth. Preparation of a tooth for veneer will involve removal of nearly 0.5 mm of the enamel (almost equal to the thickness of the veneer). For this purpose, the surgeon may numb the area with local anesthesia. This will be followed by making an impression of the tooth to be sent to the dental lab for preparing the veneer. It may take 5-7 days for making the veneer. The surgeon may affix temporary veneers to mask really unattractive teeth, till the time the veneers are back from the lab. The veneer is temporarily placed over the tooth to see if it fits well and matches the natural color. Parts of the veneer are trimmed off till the time it is not an exact fit. The tooth is prepared by cleaning it, polishing it and is roughened by etching so that it gets strongly bonded with the veneer. After applying special cement to the veneer, it is placed on the tooth and properly positioned. A special laser beam is flashed over the cement to activate the chemicals present in it so that it hardens and sets quickly. The procedure concludes with the dentist removing extraneous bits of cement and checking the veneer for its correct placement. X-rays may be taken to check the roots of the receiving tooth as well as the bone surrounding it. A root canal treatment may be performed in case the tooth suffers from severe decay and infection. The receiving tooth and the surrounding gum tissues will be numbed with local anesthesia. To make adequate space for the crown, the receiving tooth will be filed down. In case damage and decay have caused large parts of the tooth to be missing, the missing area will be filled up using filling material. This will be followed by making impression of the prepared tooth. 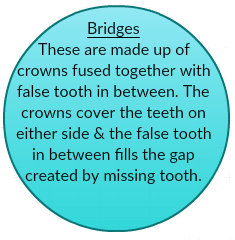 To ensure that the crown doesn't interfere with the bite, impressions of the top and bottom teeth around the receiving tooth will also be taken. These impressions will be sent to the lab for fabricating the crown. In case of porcelain crown, it is ensured that the crown is of the same shade as the surrounding teeth. 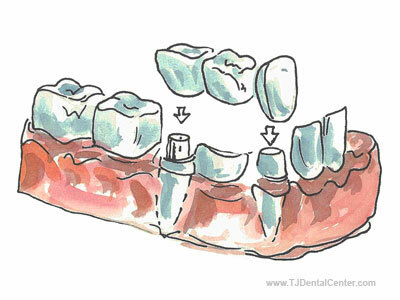 The prepared tooth will be covered with a temporary cap to protect it from further decay and degeneration. During the next visit, the temporary crown will be removed and the permanent crown will be fixed into place using special cement. Avoid chewing gums and other sticky foods which could pull off the crown. Avoid eating hard foods, such as raw veggies and ice, which could break the crown. 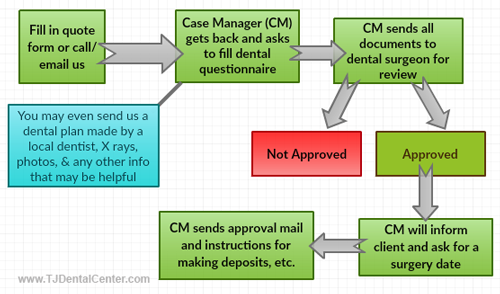 For more information on full mouth restoration in Tijuana - Mexico, fill in the quote-request form on the right.